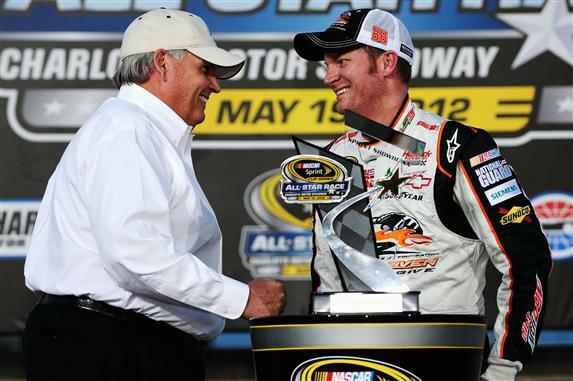 The annual NASCAR Sprint Cup All-Star event at Charlotte Motor Speedway is an reward for the winning 2011 and 2012 race winners in the series (or recent All-Star race winners. With 20 drivers earning a place into the race, three additional competitors had a final opportunity to participant in the one-million dollar event All-Star. Ahead of the Sprint All-Star race, a 40-lap Sprint Showdown race held at Charlotte Motor Speedway gave the non-qualifying drivers a chance to make Saturday night's main event. For the first of two 20-lap segments, NASCAR Sprint Cup Series stock car drivers were ready prepared to claim either the first or second place position in order to transfer to the All-Star group. A race-making move was made even before the green flag of the event. Pole sitter AJ Allmendinger driving the #22 Pennzoil Dodge suffered a deflating tire during the pace laps. As the green flag was ready to start the Sprint Showdown, Allmendinger ducked down onto pit road for a replacement tire. This action promoted the #88 Chevrolet of Dale Earnhardt Jr to the front-starting car on the inside row. Outside front row starter Martin Truex Jr in the #56 Toyota and Dale Earnhardt Jr immediately engaged in side-by-side combat in the first two laps of the event. Former teammates, the on-track fight between Earnhardt Jr and Truex Jr was fiercely fought until the #88 car gained an advantage through turn 3 on lap 2. The #88 Chevrolet sponsored by the Dale Jr Foundation, was put into a position that the Hendrick Motorsports driver would nor relinquish. Into the second stage of the Sprint Showdown, the second place position in the race (the second and final transfer spot) was heavily battled. With all but 6 drivers pitting ahead of what was the final 20-lap run, the green flag for the second segment would become a matter where fresh tires favoured used tires. Taking the second place spot early in the second segment of the Sprint Showdown, Jamie McMurray soared around the #56 NAPA Toyota but was soon fighting off the charging of a resurgent AJ Allmendinger. In the second-last lap of the second segment, the Allmendinger's #22 Dodge completed a pass on McMurray's #1 Chevrolet. AJ Allmendinger received the final transfer spot into thet Sprint All-Star race with the second place finish. Dale Earnhardt Jr's first win in the Showdown event, he promotes the entire Hendrick Motorsports racing machines to the Sprint All-Star race. Earnhardt Jr won the All-Star race at Charlotte Motor Speedway in his rookie year of 2000.